I’m no stranger to infusing my own liquors at home. 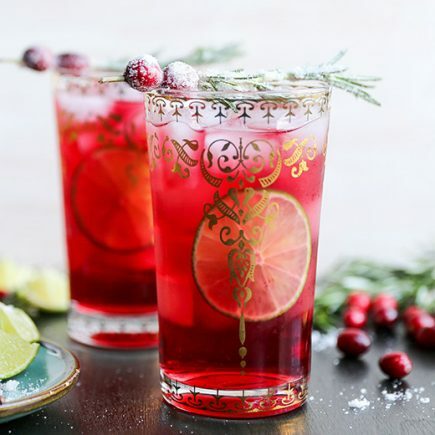 It’s a really fun way to give standard, store bought spirits some fun flavors and a touch of personality. In addition, they make fantastic gifts. Everyone appreciates something homemade, ESPECIALLY when it doesn’t have a particular time stamp for when it needs to be consumed. My Honeycomb-Bourbon was a big hit this past summer. I was trying to decide what to make for this summer when a big ‘ole pile of lemons landed right in my lap this January. It took me all of about 30 seconds to decide to make Homemade Limoncello. An Italian tradition, Limoncello is a great way to start or finish a meal. It’s clean, bright and refreshing. 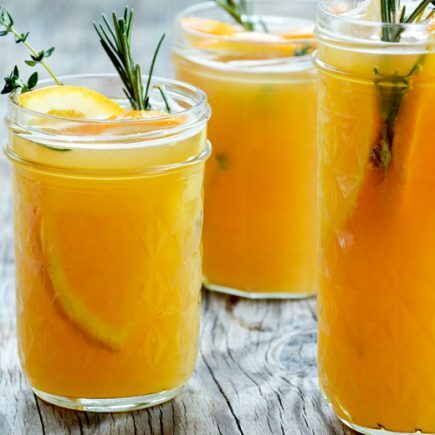 And perfect for sipping on during those long, hazy summer nights. 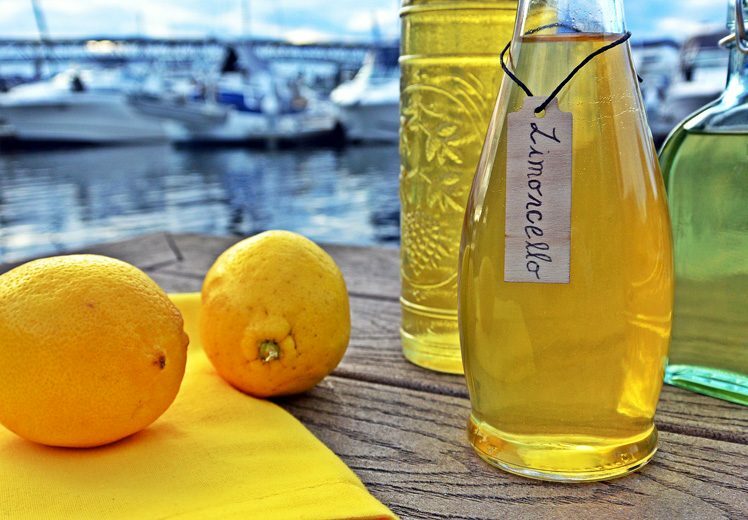 There are just a few things to consider when making your own Limoncello. One is what vodka to use. The higher the proof the better. The majority of vodka sold in the grocery store will be 80-proof, but you want to buy 100-proof if you can. The second thing to consider is time. I’ve seen recipes that take anywhere from 5 days to 5 months. I decided to split the difference and make mine over the course of a two month period. The longer the better, so don’t cheat yourself on this. This is where all the flavor comes from. The Limoncello will take on a smoother, more refined flavor and texture as time goes on. So this is why I’m bringing you this recipe NOW. You can start today (OK, I’ll give you until tomorrow) and be enjoying your own Homemade Limoncello well before the first heat wave. With respect to the lemons, try and find some that haven’t been sprayed since you are exclusively using the peel for this recipe. 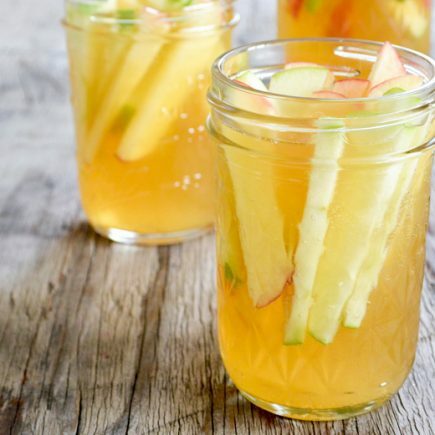 Thoroughly clean out a large Mason jar (or other container with 1.5 liter capacity and a tight fitting lid). Some people recommend sterilizing your jar by running it through the dishwasher on the hot water cycle. I simple washed mine by hand and rinsed it with lots of hot water. Using a vegetable peeler, remove the peel from the lemons. Try to only get the yellow rind, as the white pith is bitter tasting. Place the lemon peels in your clean jar/container and add the vodka. Seal and place the jar in a cool, dark place for 30 days. I gave my jar a little shake every few days, but I don’t know if this is necessary (it’s mostly just fun!). After 30 days, make the simple syrup. In a small saucepan over medium heat, bring the water and sugar to a low boil, stirring until the sugar is completely dissolved (about 3-5 minutes). Remove from the heat and set aside to cool to room temperature. While the simple syrup is cooling, strain your lemon/vodka mixture. First strain it into a large bowl or pitcher using a regular colander or strainer. This will catch all the big lemon peel pieces. Now strain it a second time to catch all the smaller pieces. For this second step, I lined a small strainer with a standard coffee filter and poured the lemony vodka through the filter. If the coffee filter starts to get too clogged during straining, just change it out with a fresh one. You could also use a fine mesh cheesecloth for this second step. Once you have completed the two straining steps, place your lemony vodka (it should be yellow!) back into it’s large Mason jar/container (give it a good rinse before you do this). Add the cooled simple syrup. Seal and store in your refrigerator for 30 days. After the 30 days, transfer the Limoncello to smaller seal-able jars/bottles (this is where the funnel comes in really handy!). Store in your freezer for up to several months. Limoncello is best when it’s icy cold! Enjoy! 1. I recommend juicing all the peeled lemons and freezing the juice in an ice cube tray. When you need some lemon juice for a recipe, just thaw a cube or two. Or save the frozen lemon cubes for summer and make lemonade. 2. Large Mason jars can be found at hardware stores or kitchen supply stores.